Successfully Added Digital Bluetooth Body Fat Scale - Body Composition Analyzer, 4.3 Inch LCD display, Free Android + iOS App to your Shopping Cart. Bluetooth weighing scales that measurement weight, body fat, moisture content, BMI, bone mass, muscle mass, visceral fat and BMR so you can take charge of your health. What’s the major difference between this scale and your standard bathroom scale? This one will keep you honest by automatically recording your weight and a range of other details each time you step on. It does all this by using bioelectrical impedance analysis, BIA for short. BIA is considered one of the most reliable and accessible methods of screening body fat. It works by using a small electric signal that is circulated through the body and measures the impedance or resistance to the signal as it travels through the water that is found in muscle and fat. Once this data is combined with your age, height and a few other details the phone's application can use the BMI data from the scales to calculate body fat, moisture content, BMI, bone mass, muscle mass, visceral fat and BMR. What’s more all this data can be sent to your smart phone and plotted over time so you can track your health, set weight goals and stick to them and keep tabs on how healthy your body is. The app for Android or iPhone devices is called 'Healthy Weight Management' and once downloaded can communicate directly with the scale using Bluetooth technology. This makes tracking your weight, BMI, and other health readings a seamless experience. This scale is smart, too, as it allows the whole family to use and monitor their health on their personal mobile devices as it supports up to ten users. If the scales detect that no Bluetooth device is connected it will automatically switch to a standard weighing scale mode and display the weight on the 4.3 inch LCD display. 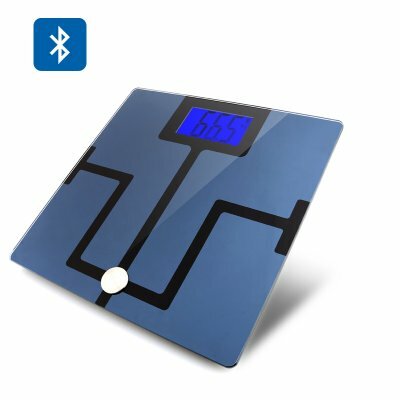 This exceptionally advanced Bluetooth weighing scale is a great addition to any bathroom especially for the health conscious who will find it a real boost to tracking their fitness. This product is in stock now, we guarantee next working day shipping and offer a 12 months warranty on all our products. Brought to you by the leader in electronic devices and wholesale health gadgets, Chinavasion. Persons with Pacemaker or wearers of other medical implants with electronic components are not recomended to use this product. Download App called 'Healthy Weight Management' and install on your phone. You can then connect to the scales via bluetooth. Read user manual before use.